Our Spring Issue of The MedVet Updateincluded information about opioid shortages and new ways to manage acute and perioperative pain.The opioid shortage has brought to light the opportunity to share some additional options for managing pain in dogs and cats. Many of the options listed are newer technologies for veterinary medicine and some are rather ancient. We will review laser therapy, acupuncture, and the Assisi Loop for alternative pain management in dogs and cats. All, however, have a place in managing pain experienced by our Patients. Photobiomodulation, or laser therapy, is the application of a therapeutic dose of light to impaired tissue to initiate a cellular response to reduce pain and inflammation and to speed healing. The light therapy is dosed specifically for acute and chronic conditions. Inflammation in tissues is reduced as the light therapy causes vasodilation, activation of the lymphatic system, and reduction of pro-inflammatory mediators like PGE2 and the COX-2 enzyme. Suppression of nociceptors in the region where the light therapy is applied will increase the stimulation threshold and increase tissue endorphins. Figure 1. 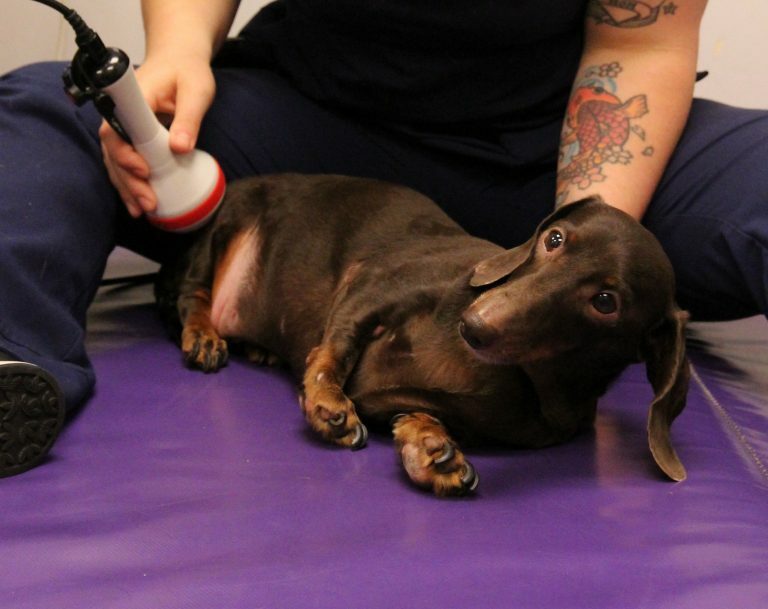 Dog receiving laser therapy for pain. Laser therapy may suppress central sensitization and result in long-term depression of persistent pain (Figure 1) with increased application. It is non-invasive and can provide non-pharmaceutical pain relief. When used appropriately, there are no side effects. There are, however, a few contraindications. These contraindications include treatment over growth plates of immature animals and treatment over an area with active hemorrhage. Appropriate eye protection is required to be worn while using some laser units. You may have heard of the Assisi Loop, which is a targeted pulsed electromagnetic field (tPEMF) device (Figure 2). This type of therapy is specifically configured to target production of nitric oxide (NO), which helps the body combat inflammation and enhance healing. The tPEMF promotes vasodilation, and therefore oxygenation, in damaged human and animal tissues. One hundred percent of the dose is dedicated to enhancing NO which will reduce pain more efficiently. The Assisi Loop is labeled as a non-pharmaceutical anti-inflammatory device (NPAID). It has been scientifically proven to alleviate pain and inflammation. Some veterinary studies have shown significant improvement in incisional pain, lower levels of GFAP (a structural protein released with neurologic injury), and improved proprioception when used after spinal surgery. Another advantage to this therapeutic device is that it can be sent home with the patient. Currently the only contraindication for tPEMF therapy is use over implanted systems including leads, for example pacemakers and nerve stimulators. It has been shown in human clinical trials and through research on animals to be safe for use over tumors, or post-operatively after removal of tumors. Figure 2. 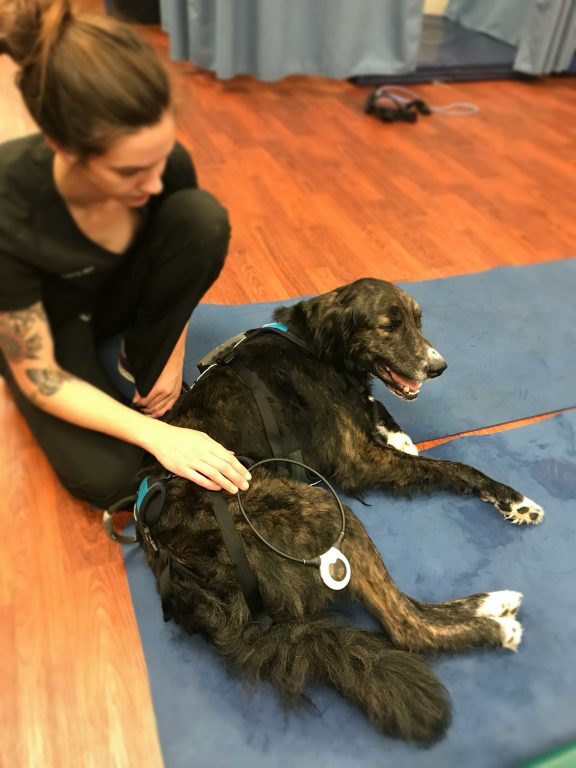 Assisi Loop, which is a targeted pulsed electromagnetic field (tPEMF) device, being used on a dog. Acupuncture is one of the oldest integrative treatments available for pain management. It has been used consistently over the last 4,000 years. It is somewhat difficult to summarize how acupuncture works in just a few sentences, but, in general, the stimulation of an acupuncture point produces a physiologic response and therapeutic effect in the body. Acupuncture is based on Traditional Chinese Medicine (TCM) theory that “life energy” (Qi) flows through the body in channels close to the surface of the skin. There are specific acupuncture points that correspond to different body systems. With illness, some of those channels can become blocked or enhanced. With stimulation of specific points or channels, homeostasis can be achieved to allow healing of the body. Figure 3. 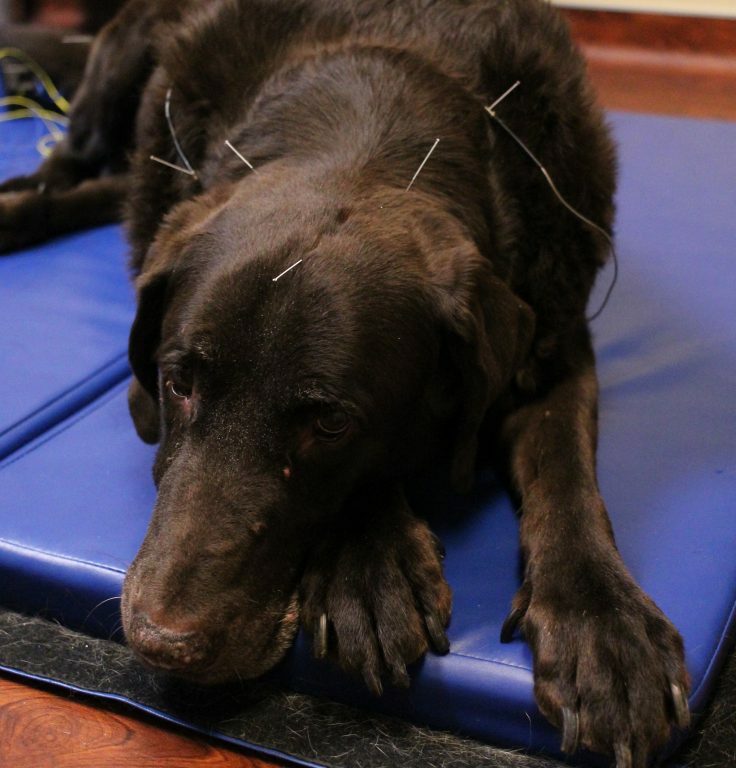 Dog receiving acupuncture. A modern theory pertaining to acupuncture is that the points of treatment are where many large touch and pressure receptor fibers and small unmyelinated pain receptor fibers converge. Treatment in these areas may affect the “memory banks” in these cells, therefore producing an amnesia effect in these cells and also reducing pain. Acupuncture is also theorized to cause a release of neuro hormones such as Beta endorphins from the brain which can trigger a sense of euphoria. This can increase the pain threshold and they feel less pain and a greater sense of well-being. Some controlled studies have shown that acupuncture can elicit various physiologic changes, including analgesia effects (see Figure 2). There are no contraindications for Acupuncture when used for pain management. Some other pain management options to consider are herbal and homeopathic preparations such as T-Relief (formerly called Traumeel) and herbal blends. These can typically be safely integrated with more traditional medications as well as used alone in patients that may be sensitive to anti-inflammatory drugs. There are even veterinary herbal products available that have been well-studied and come with dosing instructions to make prescribing products like these easy. For more information about the pain management treatments discussed above, please contact our Rehabilitation and Integrative Medicine teams. Our team is very familiar with these modalities and are happy to answer questions you may have. Schoen, A. M., & Wynn, S. G. (1998). Complementary and Alternative Veterinary Medicine Principles and Practice. St.Louis (Misuri): Mosby. Millis, D., & Levine, D. (2014). Canine Rehabilitation and Physical Therapy (2nd ed.). St. Louis, MO: Elsevier.